Most of us love new clothes! They are "perfect"–colors are bright, lines are crisp and pristine. So why would you ever wash them and risk changing the look before you even get a chance to wear them? There are three good reasons to wash new clothes, especially pieces like underwear or t-shirts and shorts that are worn in direct contact with your skin before you wear them. It is possible to transfer lice, scabies, bacteria, and fungus from one person to another person when clothes are tried on. Dressing rooms can become breeding grounds for everything from viruses to athlete's foot. Why take that risk? And, most importantly, new clothes should be washed to remove the chemical finishes like Urea formaldehyde that manufacturers put on clothes to enhance color or texture. The finishes won't bother everyone, but if you have sensitive skin, you can develop a rash especially in constant contact areas like armpits, collars, cuffs, and trouser waists and thighs. Urea formaldehyde is often the chemical used to prevent mildew from forming on clothes that have to be shipped long distances in hot, humid containers from Asia and South America to the United States. It has a very sharp odor that will remain in the fabric until the garment is washed. One washing will probably not remove all of the formaldehyde but you will reduce the resin significantly, and it will continue to be removed with each wash. It is especially important that children's clothing, especially clothes for babies, be washed before they are worn. Babies are particularly sensitive to chemicals, and skin rashes can occur. Select a detergent that is fragrance-free and dye free because detergent dyes and scents can also cause skin reactions. Plus, washing the new clothes for children will make them softer and more comfortable to wear. Washing new bed linens and bath towels is also important to remove applied chemicals since these come in direct contact with skin. Washing will also improve the absorbency of the fabric by removing surface fiber coatings. If you have a tag on the garment that reads "wash separately before wearing, "beware of dye transfer and color bleeding. Washing will help remove some of the excess dye but check the rinse water after each washing. If color remains in the water, you will continue to wash separately or with similar colors. It may take several washings to get rid of the excess dye and prevent damage to other fabrics. What About Used or Secondhand Clothing? 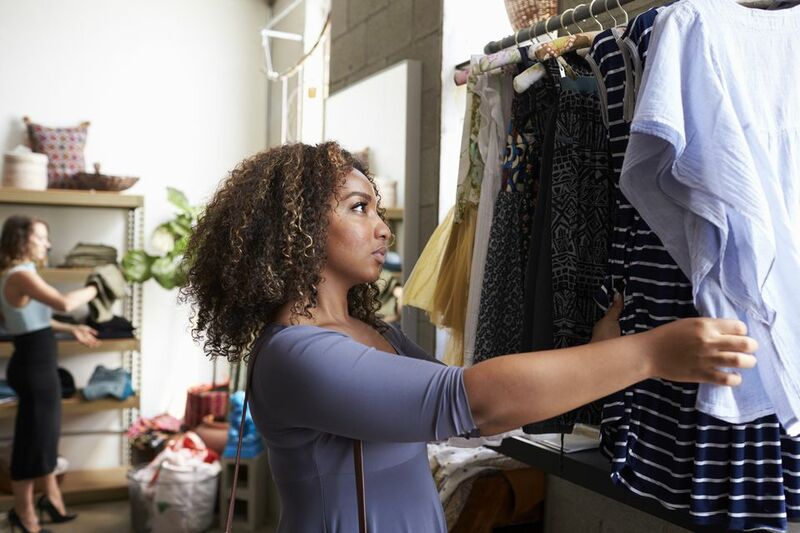 Clothing from consignment or thrift stores should always be washed or dry-cleaned before wearing for hygienic purposes and to prevent skin irritation. Even though these clothes have probably been cleaned before being placed for sale, washing in your regular detergent will ensure better results for your family. This is particularly important if someone in your home has a sensitivity to fragrances like those in fabric softeners that so many people love. If the clothing has excessive odors from perfume or scented products, you should take extra steps beyond just washing. Wash as suggested and if the odor remains, use fresh air to help remove the scent. Or, soak the clothing overnight in a sink or bucket filled with lukewarm water and 1 cup of baking soda before washing. Add one cup of distilled white vinegar to the rinse cycle to help strip away any detergent or fabric softener residue in the fibers that may be holding onto the scent. Allow the freshly washed clothes to air dry in a breezy location and give the item a final sniff test before wearing. What Can I Do to Reduce Exposure to Chemicals on Clothing? You can avoid some chemicals by shopping for organically produced natural fiber clothing. But be sure to read the care labels because not all cotton and linen and wool clothing is created equal. Manufacturers apply chemicals to prevent mildew, and natural fibers are particularly vulnerable to mildew if exposed to moisture. Choose clothing that can be washed at home to avoid any chemicals used in the dry-cleaning process.